उत्तरप्रदेश सामान्य ज्ञान प्रश्नोत्तरी (UP GK Quiz in 35 in Hindi): Uttar Pradesh (UP) General Knowledge Sample Question Paper with Collection Objective Questions based on उत्तरप्रदेश पुलिस आरक्षी परीक्षा भर्ती पेपर 2013. You can Download Complete Solved Exam Papers on "INDIA GK" Free Mobile App. 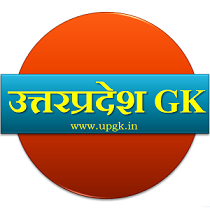 Uttar Pradesh GK website www.upgk.in offers UP General Knowledge (GK), UP Current Affairs for various examinations like UPPSC, UPSC, UP Police, Teachers, Patwari and other exam of Uttar Pradesh (UP) Govt. and central Govt.